In April and May 2017 during federal budget talks, there were calls for cuts to Medicare, as well as discussions that not enough was being cut in President Trump’s budget from Medicare. Cuts to Medicare are often raised during budget season and are not a surprise in terms of deficit reduction possibilities. However, it is important to address Medicare outside of the budget and deficit reduction conversation. The structure of Medicare provides coverage for all basic needs for an individual as they age. However, as they age income insecurity and increased health needs creates an imbalance that impacts older women more substantially then men. The basic structure of Medicare consists of four parts each covering different aspects of medical care. Part A covers inpatient medical needs. Part B covers outpatient, diagnostic, and related services. Part C covers what Part A and B covers but using private health plans to do so; such as health management organizations. Part D covers prescriptions using private plans with some cost-sharing for enrollees that have limited incomes. 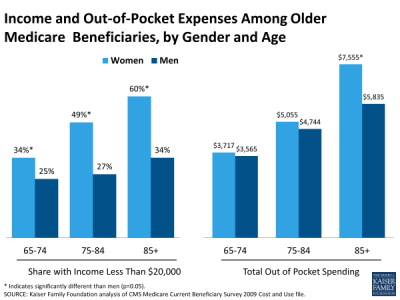 For Medicare enrollees that majority of women are of limited income. Each cycle of budget cuts and considerations of reform for Medicare put potential income strain on an already inequitably impacted minority population; women 65 and older. For this population, there are significant issues with health needs and access. Ranging from coverage for complicated chronic conditions, to financial strain due to coverage gaps for needed long term services and support. For elderly women, there are already challenges with an inequitable impact of Medicare coverage and cost compared to their male peers. Individuals who are enrolled in Medicare are likely to be living off social security and/or retirement. This monthly income is most likely to be lower for women due to the income inequality of making less than their male peers during their lifespan. Thus receiving less income monthly post retirement age. For those over the age of 65 12 percent of older women live in poverty compared to 7 percent of their male peers. This then translates to higher out of pocket costs when compared to income for women in terms of their health care. Resulting in relying on Medicare for some income and health security for elderly women. 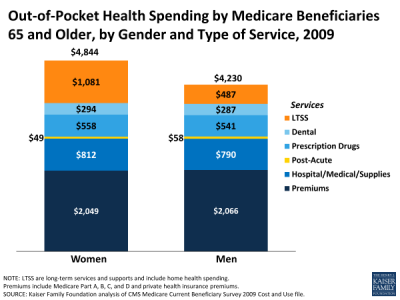 It is important to take into consideration the increased impact Medicare cuts and changes will have on women 65 and older compared to their male peers. Fifty-six percent of Medicare recipients are women, and two out of three of them are 85 and older, that is approximately 80 percent of the Medicare population over 85 is women. This indicates that they are significant stakeholder when considering policy changes to Medicare. The Kaiser Family foundation in 2009 showed data that when looking at out of pocket costs women spend more overall, especially in long term services and support. Medicare provides a framework of health security for women over 65. As deficit cuts continue to be a topic each budget season it is important to continue to understand the population most impacted by cuts to coverage and actions that would raise out of pocket spending for this population. A population that already spends more than their male counterparts, as well as lower incomes. While reform and restructuring of Medicare is needed and has considered to maintain sustainability of Medicare for current and future generations of men and women. The importance of Medicare for women over 65 should not be minimized. Women often live longer than men but as other policy problems have indicated women do not have equitable employment benefits in terms of income. These are women who potentially have limited income security and limited access and support from non-governmental services. They are less likely to be able to adjust to added out of pocket costs as they work to maintain their health and use needed health care services. Sustaining the program is crucial for women as they age. However, so is balancing financial challenges faced by this aging population. Due to the need for older women to have Medicare as a supportive service for health coverage as they age the conversation on Medicare shouldn’t happen just around conversations about the federal budget. This policy problem for sustainability should be actively engaged by the legislative body. Reform is critical for sustainability and must be done carefully as it impacts a vulnerable population that relies on it for limited health and income security as they age.